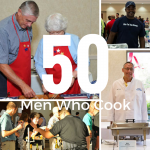 CASA DeKalb County will host its 14th annual 50 Men Who Cook at Barsema Alumni & Visitors Center on the NIU campus to raise awareness of its advocacy for abused and neglected children in DeKalb County and to raise funds to support the work of its volunteer advocates. Come enjoy a sampling of delicious food, musical entertainment, raffles and a cash bar. For more information and ticket purchase, visit www.50menwhocookdekalb.org.